At a pier on the Chicago River on 24 July 1915, as the passenger steamer SS Eastland prepared to embark across lake Michigan, chief engineer Joseph Erickson grew increasingly concerned about his ship’s demeanor. While the long line of passengers strolled up the gangplank, the engine room crew pumped water into the ballast tanks to keep the ship and its shifting load on an even keel. But the Eastland was being more persnickety than usual on that particular morning, seemingly intent on leaning a bit to one side or the other. 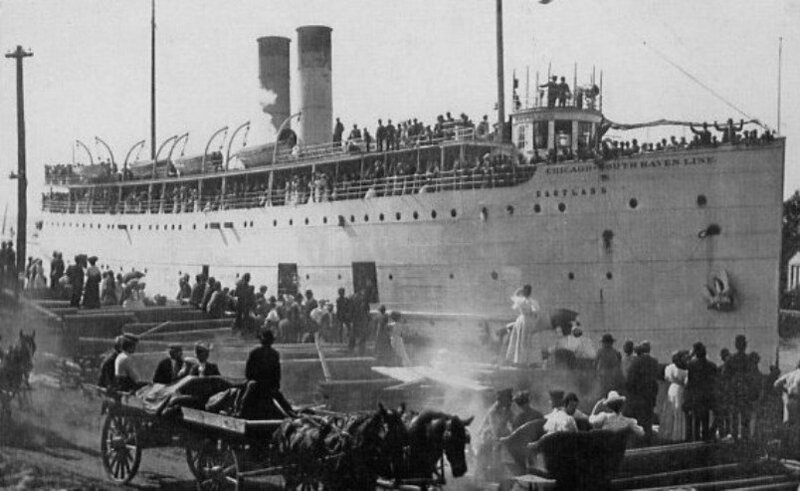 The hundreds of Western Electric employees on board the passenger liner were bound for the company picnic in Michigan City, Indiana, just across the lake. The annual event was typically filled with frolicking and festivity, so the ship was brimming with excited families and plentiful picnic baskets. When the vessel reached its capacity of 2,500, the gangplank was brought in and the ship’s orchestra sprang into action in the ballroom. Many passengers began dancing in spite of the crowded conditions, unconcerned with the slowly increasing slope of the dance floor. Joseph Erickson had only been employed as the chief engineer for a few months, but he was familiar with the vessel’s history of similar incidents. The prior episodes of listing had always been resolved by shuffling ballast, so he saw little cause for concern; however the Eastland’s crew did not fully anticipate the effects of some recent modifications to their ship. The vessel’s owners had recently added some weight to the upper decks, including several additional life boats and a few dozen tons of deck-reinforcing concrete. Together these factors raised the steamer’s center of gravity considerably. In the engine room, Erickson organized the effort to set the stubborn vessel upright. Fearing that the ship had somehow become entangled, he sent someone outside to check the hull for contact with the pier. But over the next few minutes the mighty steamer finally sat up straight as two of the starboard ballast tanks filled. With the situation seemingly resolved, Captain Harry Pedersen gave the order to begin preparations for departure. A baggage handler cast off one of the stern lines while a mass of passengers stood at the starboard rail waving goodbye to the people on the pier. As the engines began to nudge the steamer forward, it once again slouched perceptibly towards its port side. The passengers traded humorous remarks regarding the dance floor’s gradually increasing slope while chairs slowly slid across the deck. However the mood became apprehensive when the engines were stopped, and the sound of beer bottles crashing from the counter tops echoed through the compartments. A troubled murmur erupted, but it was cut short by the whooping of the ship’s warning whistle. Apparently the struggling ship was starting to sip water from the river through her port gangways. On the pier, the harbormaster instructed the ship’s second mate not to cast off any more lines until the seriously listing ship could be righted. The stern of the Eastland began to slowly swing away from the wharf, and the uneasy men and women aboard the vessel dug in their heels as the tilt increased to about thirty degrees. The orchestra was belting out an upbeat ragtime tune as the engine room’s workers emerged on the deck and headed for the exits. Dishes spilled from the shelves and tables begin to slide across the deck. As the tilt reached an alarming degree, Captain Pederson on the top deck was heard to shout “For God’s sake, open up your gangway!” at a crew member below. Panicked passengers began to boil up from the lower decks carrying their children, and desperate men and women leaped from the sides of the ship into the river and onto the pier. The orchestra’s merry music stalled suddenly, replaced by shouts of “Every man for himself!” and the sharp cracks of snapping mooring lines. As the water ingressed on the port side and the humans egressed on the starboard side, the redistribution of weight rapidly pushed the vessel to its tipping point, and at 7:28am the world inside the massive steamship Eastland suddenly went sideways. Passengers on the top deck were thrown into the river, many of them pinned under the hull or swamped by the wake of the capsized ship. Inside, the passengers in the crowded compartments were tossed into heaps on the port bulkheads as furniture rained down on them. Some were crushed by rogue refrigerators, pianos, and equipment, and many others were pinned under piles of panicked people as the water came rushing in. As the Eastland settled on its side in the mud of the shallow Chicago River, witnesses stood stunned for several moments. But within seconds, the bystanders on the docks began to throwing anything that would float into the water for the floundering victims. Some dove into the river and ferried people to safety while others stood at the water’s edge and lifted the disoriented, waterlogged victims onto the pier. A nearby tugboat immediately pulled alongside the Eastland, allowing the crowd of passengers standing on her overturned hull to leap on board. Inside the skewed engine room, chief engineer Erickson found the controls to turn on the injectors before making his escape, bringing cold water into the boilers to reduce the likelihood of a boiler explosion. He then clambered his way up through an air duct and out a porthole, where the men standing outside pulled him to the safety of the ship’s exposed side. "Tenderly removing from the hold a body in which a spark of life still lingers", a photo of the rescue later used as a postcard. The printers obscured the victim's face. Soon the capsized vessel was straddled by rescue workers who labored to carve holes in the Eastland’s hull while muffled screams could be heard from inside. By the time the torches chewed through the thick plating, however, most of the screams had quieted. Few of those inside the ship were found alive, but men entered the compartments nonetheless, searching desperately for signs of life. Makeshift morgues were established in several of the surrounding buildings. It took days for the city divers to extract all of the bodies from all of the Eastland, and the corpses were laid out in rows for identification by family members. Many of the Western Electric employees had brought along their entire families to attend the company picnic festivities, resulting in a few instances where no family members survived to claim their remains. In all, 844 souls perished in the Eastland disaster, including 472 women, 290 children, and 82 men. Only four members of the ship’s crew were killed. Churches and cemeteries in Chicago were quickly overwhelmed by the scale of the disaster, so some mourners were compelled to hold combined funerals and to use freight trucks as improvised hearses. Many of the survivors endured a seemingly endless chain of their coworkers’ funerals in the weeks that followed. Each of them also required a series of typhoid fever inoculations due to the time they spent in the Chicago River. Shortly thereafter, many of the Eastland crew were arrested and questioned in response to a public outcry for an explanation. As Captain Pedersen and his first mate were escorted to headquarters at the city hall, an angry mob tried to attack the two men. One of the crowd members managed to punch the Captain in the face before the police were able to intervene. During the investigation that followed, it was determined that the crew of the Eastland did nothing criminal before or during the disaster, nor was the accident a result of their actions. The US District Court of Appeals also found that the Eastland’s owners— the St. Joseph-Chicago Steamship Company— were not liable for any of the deaths resulting from the Eastland disaster. While a flurry of civil actions continued afterward, no further criminal suits were filed. Fireman Leonard E. Olson carries the body of a child pulled from the water. The Eastland’s slow-reacting ballast tanks certainly contributed to its demise, but capsizing was ultimately blamed on the Eastland’s poor weight distribution. In the wake of the Titanic disaster of 1912, the US federal government had enacted the LaFollette’s Seaman’s Act which stipulated that seagoing vessels must have an adequate number lifeboats on the deck. Ironically, by complying with this regulation the Eastland’s owners had piled an additional 10-14 tons onto their already top-heavy ship, contributing to a higher center of gravity and reduced stability. In October 1915— three months after its tragic spill into the river— the remains of the Eastland were raised and sold to the Illinois Naval Reserve. The Navy restored the vessel to seaworthiness, and recommissioned it as the USS Wilmette. It served as a training gunship on the Great Lakes for another thirty-two years until it was sold for scrap in 1947. The Eastland disaster was the single most deadly accident one of the deadliest accidents to occur in the US in the entire twentieth century, yet its story remains mired in obscurity. Some blame this oversight on the brilliant whitewashing campaign undertaken by the ship’s owners in the months after the accident, whereas others suspect that history makes little room for working-class tragedies. Indeed, a week after the disaster a millionaire heiress in Michigan was married, and the press coverage of her wedding garnered more attention than the Eastland did. At times, society itself seems alarmingly top-heavy and precarious. Perhaps a few lifeboats would help. Written by Alan Bellows, copyright © 29 March 2007. Alan is the founder/designer/head writer/managing editor of Damn Interesting. Last updated 29 December 2018.
happened before, it will happen again. Reminds me of the story about a Civil War Era steamship that had been overloaded with the war weary trying to get home. Ship exploded. Having dove in the Pacific in WWII era wrecks that still contained the sailors who when down with the ships, you get a better feel how one can become lost in a lisping or overturned ship. As errna said and btw to show how little has changed in the centuries: in old Rome everyone was moaning about the traffic, it stank, you never could get in or out of the city in the morning or in the evening and the ever increasing taxes which never gave more parking space. Nevertheless a nice story. Ironic how new safety laws doomed this ship. However again nothing new under the sun. One solution is often the cause of another problem. I think one of the most interesting things is that a majority of the stories found on DI are mired in obscurity. One of the things I think when reading most DI articles is “why didn’t I already know about this?” I love trivia, factoids and history in general…strange that most of the stuff on here is not really “public knowledge”. DI does it again….love the last sentence. So true. Ah, found it. The steamship was the Sultana. On board that fateful day were Union POWs from Andersonville and other wretched Confederate camps heading home. The US Government was paying shipping companies a tidy sum, $5 per man, to transport soldiers north on the Mississippi. Greed on the part of the crew and owners had them overloading the ships. On that fateful day of April 27, 1865 one of the Sultana’s four boilers sprung a leak. Rather than take the necessary two to three days to do the job right, the captain ordered a patch. The Sultana was only two years old and contained state-of-the-art designs and safety equipment. Plus they would lose all that lucrative cash to other steamboat captains hauling soldiers. In order to make-up for most of a lost day, the Captain bribed Army Officers a $1.15 for each man they put on the Sultana. This resulted in the normally 350 passenger craft to be overloaded with 2,500 souls, 2,300 of them POWs. Stanchion supports were added to support the upper Hurricane deck as it started to sag due to the weight of the men. The ship was so overcrowded that most of the sick and wounded brought aboard by stretcher were forced to stand. The Captain reassured the officers that he had hauled this many men before and finally cast off at around 9:00 PM that night. With a brief stop in Memphis for coal, the Sultana continued her trip at Midnight. Trying to makeup time, the captain ordered more steam, the patch had held fine since leaving Vicksburg at 9:00 PM and all boilers were operating without problems. At 2:00 AM the overtaxed patch gave and the repaired boiled exploded. This also caused a second nearby boiler to also explode. The mid-ship was engulfed in flames as the now weakened structure gave way allowing the dual smokestacks to fall upon the hurricane deck crushing many of the men standing there. Due to the time, confusion reigned supreme. Men started to panic and in the confusion many jumped overboard rather than fight the fire. The Mississippi was swollen with spring runoff and flowing faster than usual. By sunup the death toll was 1,700, but another 200 died over the next week due to injuries from the accident. The Sultana still resides at the bottom of the Mississippi to this day, covered in mud. Sultana – 260 feet long, sank in the swollen waters of the Mississippi with a life loss of 1,900. The Titanic was 340% larger than the Sultana and yet the Sultana suffered more than 25% greater loss of life. Yet how many people have ever heard of her? First time commenting on the site but I’ve read every article. I had to comment on this one because of the amount of life lost and yet, I have never heard about this. What I found most interesting about this article was not how many died, but who died. Look at the numbers: 472 women, 290 children, and 82 men. The claims by the survivors all say that men thwarted their attempts to save children and women, in attempts to save themselves. You would have thought in those days, when men were supposed to be emboldend by war, it would have been 472 men dying instead. I mean, unless they were mormons and each man had three wives, how do you explain a ship full of families allowing more dads than moms to survive? I’m sure there is an answer but I don’t see it. Maciple1: In defense of men: we have no info on the ratio of men to women to children on the Easland that day. Moreover, in those times, men would have been much more likely to be good swimmers. Also, the women in the water were no doubt dragged down by their heavy clothes. Being a good Chicago boy, I was always fascinated by the Eastland saga. The ship was known as a top-heavy roller, even before the additional concrete and lifeboats. There is a photograph of a fireman carrying a dead child that is just heart-wrenching. The river was VERY polluted in those days, I wonder how many survivors died of cholera, etc. afterward. This incident is better known to citizens in and around Chicago as it is featured in the local PBS station’s program “Chicago Stories” which they run regularly during pledge drives. I know I have seen the story behind this on the station more than once. I must say that it was not covered in such detail, but a more general story about the ship listing and the many people who lost their lives. I am guessing (very confidently) that this is the location at which the ship listed as it is on the river and a few blocks from Lake Michigan. Damn Interesting article, Alan. Always a pleasure. Did something happen to the other DI writers? All of the articles on the front page… even the classics… have you in the byline. There were various reasons the death toll was higher for women and children. 1. This was a picnic so the women were all gussied up in long, white dresses. Those that escaped the ship were pulled under by the weight of the dress. 2. The day was slightly overcast and there was a fine misty rain. Many of the women and children were inside the cabins trying to avoid the rain. When the ship rolled, iceboxes, pianos, and various other articles within those cabins crushed them. Then there were those in the portside cabins, which ended underwater. Those that survived the onslaught of furniture drowned. 3. Many of the workers were single women in their late teens to early twenties. So you see, it was not because many of the men were cowardly jerks, just bad circumstances that accounted for the high percentage of women and children deaths. Does anyone know if there’s a memorial at the site? It’s funny you should say that. I considered suggesting the Eastland as a DI article, but decided against it because I thought it would be “too common” and too well known. Kind of like doing a story on Lucky Lindy. I guess I am too steeped in local history. Also, the word “factoid” actually means a lie. People misuse this word all of the time. There is a small plaque by the river. I believe that there are a couple of mass graves in local cemetaries. I have heard that when saving someone from drowning, you have to get them to stop panicking or there is a good chance you will both drown. The most common suggestion is to slap them or punch them in the face if possible. This reminds me of the song “Talkin’ Bear Mountain Picnic Massacre Blues” by Bob Dylan. Is that a coincidence, or did he write the song about this? However, Dylan’s song was funny, and this tragedy certainly was not. I also find that many articles here are things that I have never heard about, but probably should have. Thanks guys. sulkykid is right on the money. You see Norman Mailer supposedly contrived the term “Factoid” in his book on Marilyn Monroe. He coined the word as “facts which have no existence before appearing in a magazine or newspaper”. He created the word by taking “fact” and adding “-oid” to simulate a word meaning “like a fact”. His definition otherwise was snippets proposed as factual material but with no supporting evidence, otherwise a false bit-of-information to help validate an article or story. During the latter part of the Twenty Century, CNN used the word to describe small bits of true and valid, but insignificant information. This gave the word a different meaning than what Mailer intended. Steve Wright uses the word quite extensively in his BBC radio show with the CNN version of the definition. Accordingly this change in the meaning can be referred to as a factlet. Fine story on the Sultana, Radiatidon. You write nearly as well as Alan. Have you ever considered submiting an article or two? I have to ask because it’s bugging me… is there a reason the General Slocum disaster doesn’t count? That was in 1904 and over a thousand people died. I was going to say that very thing, Tiercel! I read a book about the General Slocum, and while I don’t have it right here in front of me to consult, I do remember the death toll being over a thousand. You are indeed correct… I was misinformed. The text has been adjusted accordingly. Thanks for helping to keep us on even keel! Very nicely researched and written article. Kudos to Alan and DI. How does anyone who visits DI not spend the entire afternoon reading the various articles? There are several permanent exhibitions in Chicago and the near suburbs dedicated to the Eastland Disaster. The historical marker commemorating the site of the tragedy was re-dedicated in 2003. It is now located at the corner of LaSalle and Wacker. There is a permanent photo essay directly across the river from the historical marker. It is located in the beautiful lobby of the equally beautiful Reid Murdoch Center. The Chicago History Museum recently underwent a $27 million renovation. Their museum now includes a permanent exhibit on the Eastland Disaster. Morton College in Cicero recently opened The Hawthorne Works Museum, which includes a photo essay on the Eastland Disaster. Regarding the high number of fatalities among women, note that the men as well as the women were dressed in their Sunday best including wingtips, suits, ties, and skimmers (hats). One of the 844 victims was neither passenger or Eastland crew member. Peter Boyle, a 23-year-old sailor on the Petoskey, lost his life while attempting to rescue one or more who were thrown into the Chicago River when the Eastland turned on its side. One closing comment. Have you heard of the person who was awarded a settlement in the low to mid six-figures for spilling hot coffee on his/her lap? Unfortunately for the families of the victims of the Eastland Disaster, the judicial system at the turn of last century wasn’t quite as generous. The payout from the Civil Court (which, incidentally, did not hand down its verdict until 20 years after the Eastland Disaster) resulted in nothing (yes, $0.00) being paid to the victims’ families. Karl Marx once said: “History repeats itself, first as tragedy, second as farce.” No truer words could have been spoken with respect to the civil actions of the Eastland Disaster. I was born and raised in Chicago and as others have said, the disaster is far from forgotten there. One is that the article says the “the struggling ship was starting to sip water from the river through her port gangways.” The expression is that a ship “ships” water in such circumstances. 1) Approach a drowning person from behind, grabbing them with one hand at their chin exactly as you start to swim away from them -that starts to pull them into a “backfloating” position, and people usually become instantly calm as soon as they realize that someone has gotten control of them and is saving them. 2) If the drowning person does get hold of you and makes it hard or impossible for you to swim – Dive. They instantly loose all interest in you because you are headed where they do not want to go. Then come around behind them and try again. Most of all, don’t go near them at all if there is anyway they can be reached with an extended object or be thrown something that floats. An astonishing number of very good swimmers are drowned trying to save others. You probably won’t get your picture in the paper if all you did was throw a plastic cooler to a person in trouble, but if you do, at least it won’t be in the obituaries. …funny…I feel like that doing that everyday with some of the corporate American executives to keep from “drowing their companies” or running businesses into the ground…while all the time claiming their actions are for the better. Better for who? Themselves? Stockholders? Employees? Customers? Being inside a capsizing ship must certainly be one of the nastiest imaginable experiences. I still remember vividly waking up to the news of the sinking of the Estonia in 1994 (I’m Finnish)… those who survived that one said that it was next to impossible to get out of a modern ro-ro ship that had its center of gravity lifted up by water on the car deck… they aren’t designed for you to climb out of them when they are lying down on their side in the sea. Interesting that this would bring the Estonia to my mind… the events are quite similar. The Estonia’s sinking is another of the less well known shipping disasters, despite it happening just a bit over a ten years ago in a region of the world where this wasn’t supposed to be possible. Yet almost 900 people lost their lives. Native Ciceronian – I grew up a half block from Morton College. Many relatives and neighbors worked at the Hawthorne Works at one time or another over the years. It was certainly one of the main employers in town for generations. Two distant cousins (both young single women) were killed on the Eastland. Family lore always said that the ship tipped over due to the passengers all rushing to one side to wave and pose for photographs from shore. Thanks for illuminating the apparent true facts. I must confess, for all the tragedy and loss in that article (excellent as it was, too) I just keep coming back to ‘rogue refrigerators’. Regarding rescuing drowning people, there is one rule that is taught to all emergency workers (police, firemen, lifeguards [I was a lifeguard for over a decade]) regarding emergency and disaster response – rescuer safety comes first: You cannot save anyone else once you are dead, and the people you have already saved in a disaster situation will need you to continue caring for them. If you are not a trained lifeguard you should never under any circumstances get into the water with a concious, active drowning victim – they are many times stronger than you are due to all the adrenaline and panic in their system, and punching them doesn’t really work that well. This is the reason the majority of drownings are double drownings – when the person in distress begins flailing about they will grab anything and anyone near them in an attempt to get air. When the very first lifeguarding programs in this country were being organized it was believed that only trained boxers and wrestlers were suitable for the job, as no one else would have the strength to escape the drowning victims clutches. In modern times technique has replaced a good deal of the strength required, and lifeguards have floating rescue aids with them in most situations. If you disregard that advice, be aware you are likely forfeiting your life by getting into the water and keep some object between yourself and the drowning person: when they grab onto that object you can tow them to safety with it – and if/when they attempt to grab you, you can let go of the object and retreat. You can use anything from a tree branch to an oar to a folding lawn chair to a beach towel rolled into a rat tail, but keep them from getting ahold of you because once they have drowned you, they will be in the same position they were in before you arrived: drowning and without help. The only difference would be two deaths instead of one. Were the ‘rogue refrigerators’ really refrigerators, or were they ice boxes? In the old days an ice box was really a box that held ice (like a modern picnic cooler). I didn’t think refrigerators were common in 1915.
lost in a lisping or overturned ship. That is so sad. Particularly the personal accounts where someone was unable to save another person because of someone’s panic. Good job Gerry they taught us these same things in Marine Corps. I was a crew chief on a helicopter, and we had to be “water safety qualified” in case the bird went down at sea. A drowning woman might be “many times stronger than you are due to all the adrenaline and panic in their system”, but a drowning U.S. Marine is likely several times stronger than that!! They taught us to approach them from underwater, grab their waist, spin them so their back is to us, and grab their chin, exactly as Mr. Burns pointed out, lean their head back and swim with them. They also taught us that if this wasn’t possible, or if you had something that floated nearby, hand them that!! I think it’s cool how “sometimes” you can learn some usefull stuff as well as all of the DI stuff on this site! Good read Alan, thanks. Isn’t there a problem in the last line? Lifeboats would make it _more_ top heavy. Or was this intended sarcastically? DI article, and the information in the comments about how to save a drowning person is very useful as well. DI indeed, as are the comments. The idea that so many people died while the ship was still in the harbor, and still attached to the mooring lines. Very sad, the chaos must have been huge. Dunno for sure, but concrete is quick, durable, and cheap, compared to wood decking. The numbers mean nothing without reference to the number of women, children, and men aboard. If, for example, there were 944 woman and 82 men aboard, then the men would have lost their lives at a rate of 2:1 relative to the women (100% versus 50%). It seems like there is always more to the story. As usual, I’ve never heard of this. Probably because of my public edumacation I received. I’m thinking I should learn a lesson from this and if I arrive to board a Carnival cruise ship and it is listing I should not board. Having had some experience at the port of Balitmore in my work, it is NOT normal for a ship to list at all while docked (nor I am sure at sea) as I have seen thousands of autos offloaded in hours. Perhaps common sense would gain the edge and I wouldn’t board. I know now that I would think twice about it. For some reason, this reminds me of the Edmund Fitzgerald – don’t know why. There were plenty of opportunities for “someone” to intervene. (1) The S.S. Eastland had several near misses in the years prior to the tragedy including listing so badly that water came onto its decks. The responses to these near misses generally were that the licensed passenger capacity was reduced (usually only temporarily). (3) Years prior to this, as a result of such a horrible reputation for being unsafe, the owners of the Eastland placed an ad in the newspaper offering a $5,000 reward (which was a TON of money in the early 1900s) to anyone who could prove that the Eastland was not seaworthy. (4) A letter was written to the government reporting that the priority of the owners of chartered ships was apparently revenue rather than safety. The letter, while it did not specifically name the Eastland, did highlight the cause for concern — chartered special events, where women and children were at risk (more so than the men, who worked). Indeed, the Eastland was unstable and overcrowded the morning of July 24, 1915. Hindsight seems to indicate, however, that the tragedy possibly could have been avoided had someone followed through on the red flags that appeared months and years before. It might be due to WWI and the lack of metal available for anything other than war products…they eventually made some ships entirely out of concrete during the second World War. The “more” includes the fact that Stella was forbidden in the final settlement from telling her side of the story to anyone, but “Famous Brand” was not forbidden. Interesting how all these rumours got started claiming that she was driving at the time, that she was holding the coffee cup between her legs, that she was in a moving car, etc. etc. There were 12 concrete vessels ordered during WWI one was completed before the end of the war. Ferrocement construction was in its infancy at that time, but when done correctly results in a very strong hull. Since we were not in the war yet I don’t believe there was a shortage of materials, it was probably a lot cheaper and faster for concrete decking than wood. I doubt the owners wanted to put much money in a vessel that has a bad rep and could be shutdown by the gov’t at any time. Actually metal and wood were scarce. Twenty-four ships were commissioned thought only twelve were built. During the latter part of the Nineteenth Century, various companies were experimenting with a novel idea called the Concrete Ship. The idea being that a concrete ship could be completed and ready to sail in less than half the time it takes to build a conventional ship of either wood or steel. Small concrete boats had been built as early as 1848 in France. It wasn’t until WWI when metal and wood had became scarce due to the war effort. It was at this time that twelve experimental ships were constructed to test the theory. President Woodrow Wilson approved the construction of twenty-four concrete ships. Because the first ships were really impractical being slow, and costly to operate due to weight. Only twelve were constructed at a total cost of $50 million. S.S. Peralta – Oil Tanker built and launched in February 1921. Three years later she was converted into a sardine cannery in Alaska. Twenty-four years later she was mothballed off Antioch, CA until purchased by Pacifica Papers in 1958. She was moved to the Powell River in Canada, as is part of a concrete fleet of ships used as a floating breakwater to a log storage pond. At 128.02 meters x 16.46 m x 10,67 m she is the largest concrete ship afloat. S.S. Palo Alto – Oil Tanker built and launched in May 1919. Ten years later she was purchased by the Seacliff Amusement Company, which unfortunately went bankrupt two years later due to the Great Depression. Shortly after she split amidships during a bad winter storm and was stripped of all salvageable metal. Today she resides off Aptos, CA as a fishing pier. S.S. Atlantus built and launched in December 1918. Constructed as a cargo/transport ship, she ferried American troops home from Europe. The she was used to transport coal around New England. But finally retired in 1920. Six years later she was purchased to be use with two other concrete ships for a ferry dock. Destined to be placed in a “Y” formation at Cape May, New Jersey. On June 8th a storm hit and the Atlantus broke her moorings and ran aground 150 feet off the coast of Sunset Beach in Cape May where she resides today. The sea is a harsh mistress as can be testified by the condition of Atlantus. The hull has broken apart in various places and soon there will be nothing left of this great ship. S.S. Selma – Oil Tanker built and launched in June 1919. Struck a jetty in Tampico, Florida and severely damaged. Sent to Galveston for repair but no one there had experience let alone an idea on how to repair a concrete ship. Unsure what to do with her, she was grounded near Pelican Island, Texas on March 1922. Today she is listed on the National Register of Historic Places due to the diligence of A. Daniels, retired editor of the Houston Chronicle & Galveston Daily News. S.S. Cape Fear – Cargo ship built and launched in 1919. Struck the City of Atlanta (standard steel construction) and shattered like a porcelain plate. She pull 19 of her crew to the bottom of the ocean as she slipped beneath the waves in under three minutes. She now resides under 170 feet of water at the bottom of the Narragansett Bay off of Rhode Island. S.S. Polias cargo ship built and launched in January1919. Though the first of the concrete ships commissioned, she was launched a month after the Atlantus. Used to transport coal in New England, she was wrecked during a storm in 1920. Having struck an underground ledge during the storm she became “grounded”. All attempts to free her failed and in 1924 she rolled over and broke apart during a hurricane. She sleeps beneath 30 feet of water off of Port Clyde Maine. S.S. Cuyamaca – Oil Tanker built and launched in 1920. Used for several years to transport oil until sold for scrap in March 1926. No known location. S.S. Latham – Oil Tanker built and launched in May 1920. Struck a jetty on her Maiden voyage, but was repaired. Converted into an oil storage tank in New Orleans on March 1926. No known final location. S.S. Sapona – Cargo ship built and launched in January 1920. Stripped of her engine and used for Oil storage until 1924. Purchased by Bethel and used as a floating warehouse for rum and whiskey during the Prohibition. Blown aground a reef during a hurricane in 1926 destroying all liquor stocks. Used during WWII for target practice until the Squadron of Flight 19 vanished in the Bermuda Triangle after using her for practiced bombing runs. Resides 4 miles south of Bimini Island. S.S. San Pasqual – Oil Tanker built and launched in 1920. During a storm ran aground off Cuba and served for years as a depot and then a prison. Resurrected from a decrepit past, today she is now a ten-room hotel. S.S. Moffitt – Oil Tanker built and launched in 1920. Turned into a floating oil barge in New Orleans. S.S. Dinsmore – Oil Tanker built and launched in 1919. Last known location Texas. Unknown fate. Once again in WWII metal was scarce and in 1943 construction of 24 concrete ships began with production of one finished ship per month vs. six to eight months for a metal ship. This also included the construction of around 78 barges. Don’t let the name fool you, the concrete barge was a ship but without an engine of its own. Though the concrete ship was more prone to damage during collision, it was cheaper, easier, and quicker on the repair. Unlike the sour fate of the WWI fleet, these ships were sounder and faster than their predecessors. Thirty years of improvement in concrete made it stronger and lighter than the material used in WWI. Also unlike the WWI fleet, many of these ships are still afloat today though not in service. Once again in WWII metal was scarce and in 1943 construction of 24 concrete ships began with production of one finished ship per month. The turn around was three months for construction of a concrete ship vs. six to eight months for a metal ship. Argh… Okay it was nagging me, so I looked it up again. Concrete ship construction during WWII was estimated at around three months but they got it down to around four to six weeks from start until the hull hit the water. A very extreme turn-around in terms of ship construction. Oh, they also built one barge who’s sole purpose was to produce ice cream for the Pacific soldiers. She was able to produced over 1,500 gallons every hour. They also had plans for a ship made of ice. Concrete is good at dealing with compressive force, not perpendicular, angular or stretching forces. I know because of the whole U.N. “scientist” thing. Oddly enough, dropping concrete from a highrise onto a cat, even in the presence of scalar waves, has a disasterous effect on my appetite for 1/4 to 2 full hours. Excellent article – anybody besides me think it odd that a week after this article comes out, the Sea Diamond runs aground in Greece? No, not odd at all. Why would it be odd? Both Capts. were likely infected by Toxoplasma, increasing their risk-taking behavior. How did they get that way you ask? If you drilled a hole through the Earth between the two locations to make a Gravity Train, and dropped a cat down it, the cat would not only land on its feet, but also infect the other Capt. While it is clear that scalar waves could alter the movements of the ships- causing one to flip and the other to flap (into a reef)- I don’t think that’s the case here as I do not detect any fishingline in the areas of interest. These facts lead to an interesting question: is there a Canadian or midget influence at work here? Obviously. The Eastland’s proximity to the evil empire at the time of the accident is proof enough: we should start dropping leaflets ASAP. The midget influence is harder to detect here. Might they be the hole-drilling-cat-droppers? Perhaps, but with those tiny arms they’d be shovelin like mad. Perhaps their tinyness creates some space/time distortion, creating phantom time? Perhaps a combination of the two? Science is wearing me out, but I do it all for you guys. OK, kenfo, but where’s the odd part? It’s kenfo, the odd part-icipant. Who/what is Lucky Lindy? I’m from Australia if that excuses my ignorance. Collision said: “Isn’t there a problem in the last line? Or maybe Alan is being deadly serious, suggesting we should overload society until it collapses. Mez: Lucky Lindy–>Charles Lindbergh, flew solo, non-stop from New York to Paris in 1927 to great fame and acclaim. Ah, cheers sulkykid. I knew about Charles Lindbergh but didn’t remember the name of his plane. “Lucky Lindy” was Lindberg’s nickname, the plane was “The Spirit of St Louis”. I think the plane is hanging from the ceiling in the Smithsonian museum in Washington D.C. Sorry ’bout the confusion. Just a few comments: Concrete was commonly used for patches on Great Lakes ships (please refer to salvage practices of the time) and was cheap and very readily available. Canada, or the “Evil Empire” isn’t really anywhere near Chicago, IL. Please refer to a map. There were in those days several days travel between them. The Great Lakes have a long and ignoble history of poor survival of women and children during shipwrecks. Female cooks were commonly left behind during “abandon ship” maneuvers. Does anyone know if there is a list of those who died, I was informed that a greatgreat aunt was on the ship and died but I don’t know the name all I have is a last name. I cannot find such a list online. I suspect that I may have a distant relative or two involved, but no one in the family ever mentioned it. You might inquire at http://www.eastlanddisaster.org or the Chicago Historical society. There is a very nice picture book from Arcadia Press called “The Eastland Disaster”. 125 pages of photos with captions, lots of names, but no index. I could peruse my copy if you are willing to supply the last name. There is no official passenger list for the Eastland Disaster. Unlike the Titanic, there was no passenger manifest the morning that boarding took place. Over 7,000 tickets had been sold for the excursion and picnic, and boarding took place on a first-come, first-served basis. The Eastland Disaster Historical Society, however, has been working diligently over the past 8 years and we have compiled a passenger list of over 2,300 names. The Eastland Disaster Passenger List includes the names of the victims as well as the survivors (victims names are italicized). Please drop us an email – we would love to open a file folder for your family (or add to the one that we may already have in our archives). I’m pretty late to the party here but if you truly missed the sarcasm in that last sentence then YOU are the one aboard the failboat. You realize that photo of her with the wrecking tugs somehow got flopped, right?